The Polaniec biomass power plant in Poland is owned by GDF Suez. The Polaniec biomass power plant is designed to reduce carbon dioxide emissions by about 1.2 million tons annually. Alstom is the contractor for retrofitting the turbines to match the biomass power production unit at the Polaniec plant. Image courtesy of Petr Štefek. GDF Suez is the owner and operator of Polaniec biomass power plant, the world’s largest biomass power plant. The project is 80% fuelled by wood chips and 20% by agricultural waste. The zl1bn ($290m) biomass power plant was built at the site of the existing 1,800MW Polaniec power station in Polaniec, Poland. The plant became operational in November 2012. The existing Polaniec power plant has eight 225MWe turbines fed by coal and biomass. The biomass unit was initially planned for a capacity of 190MW, but increased to 205MW during the construction stage. It features a circulating fluidised bed (CFB) boiler, which is capable of burning biomass fuel exclusively. The environmental impact assessment (EIA) for substituting the coal fired boiler with CFB boiler was conducted during 2009-2010. "The Environmental Impact assessment (EIA) for substituting the coal fired boiler with CFB boiler was conducted during 2009-2010." Construction of the biomass fuelled power plant was undertaken to complement the European Union’s target to generate 15% of energy from renewable sources by 2020. The plant will cut down carbon dioxide emissions by about 1.2 million tons (mt) a year. Poland produces approximately 35mt/y of wood waste and 14mt/y of agricultural waste. 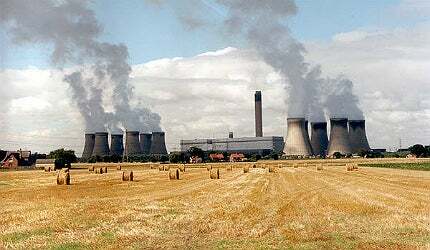 The new biomass power plant exploits these wastes to produce renewable energy. It uses up to 890,000t of wood chips and 222,000t of agricultural waste annually. In 2011 Alstom was awarded a contract to retrofit a turbine at unit eight of the Polaniec power station, to match the new biomass boiler. As part of a separate contract, Alstom is retrofitting the plant by replacing the existing turbines of units one to seven with new steam turbines and overhauling the components, to improve the turbine capacity and the plant’s service life. The upgrades are targeted for completion by 2014. The CFB boiler has a steam flow of 570tph, steam pressure of 127.2bar and a temperature of 565ºC. The steam generated by reheating has a pressure of 20bar and a temperature of 565ºC. Wood chips are produced during the chipping process at the fuel yard, while the agricultural wastes are supplied from within 100km radius of the plant. The wastes poured into the boiler are fluidised due to the heat. The entire bed is lifted and the fuel circulated to the top of the furnace, where the solid parts are separated and brought back to the furnace. The heating surfaces are provided with moderate thermal loading and the fuel is added to the furnace along with additives to prevent accumulation of unwanted materials and fouling of the furnace. Measures to avoid corrosion and fouling of the convective pass are also taken into consideration by applying corrosion resistant materials. Corrosion and fouling of the boiler is constantly checked by the online diagnostics which have been put into place. The Western Wood Energy biomass plant is the first commercial-scale power station of its kind in Wales. Tractebel Engineering carried out the EIS for the ongoing Polaniec biomass power plant. The EIS was approved in May 2010. Tractebel Engineering also provided the milling feasibility study of agri-biomass for unit eight of the Polaniec power station. In April 2010, GDF Suez awarded the contract to design, supply and erect the CFB boiler island to Foster Wheeler. The scope of work included designing and supplying the steam generator and other supporting instruments, civil works, preparing the biomass yard and building and commissioning of the biomass island. Foster Wheeler’s subsidiaries in Finland and Poland were also involved in executing some of the contractual works. Laborelec provided technical support to GDF Suez for the design of the biomass power unit. BRUKS Klöckner supplied the chipping line for the biomass power plant, which included the drum chipper and handling equipment. Emerson Process Management equipped the plant with the Ovation expert control system and AMS Suite predictive maintenance software to control the boiler. It also provided automation services such as complete project management, engineering and installation.